Who doesn’t love a good French fry? 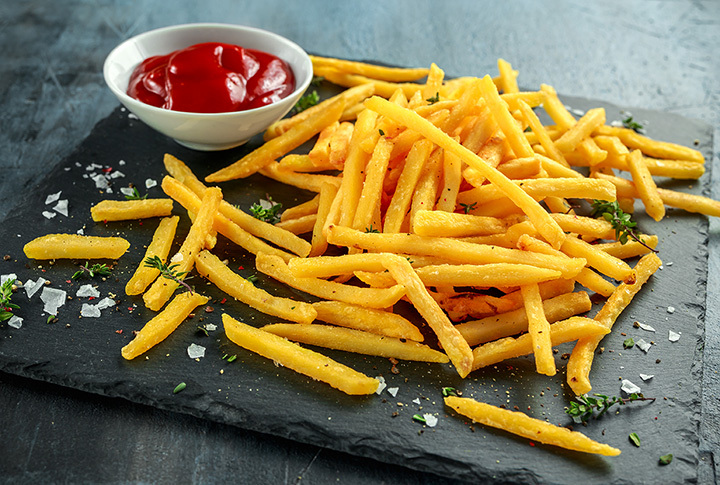 Whether you prefer straight, crinkle-cut, waffle or steak fries, there is simply no arguing that crispy, golden potato bites are delicious. Deciding who has the hands-down best French fries in Alaska is pretty close to impossible. But here are some of our favorite places to get some awesome fries in the state. Located in the Spenard neighborhood of Anchorage, Tommy’s Burger Stop doesn’t mess around when it comes to fries. You can get their standard, Cajun-seasoned French fries, or you can take it up a notch by making them cheese fries. If that’s not enough, go all out and get the chili cheese fries. You won’t—or you might—regret it. When you’re looking for fries in Homer, you won’t do much better than Captain Pattie’s. Not surprisingly, their take on classic French fries is designed to go with fish, i.e. they make chips. Crispy and golden on the outside, so they can take and hold plenty of vinegar, Captain Pattie’s fries are exactly what you’d want to go with a slab of salmon or a hunk of halibut. Located in historic downtown Juneau’s old Elks Hall, Rockwell serves up delicious scratch foods, including (of course) French fries. Their standard fries are delicious, house-cut potatoes that are deep-fried to perfection. But no self-respecting restaurant so close to the Canadian border would fail to offer poutine fries. As such, Rockwell does just that, with homemade gravy and cheese curds. And it’s delicious. Blue Roof Bistro prides themselves on bold flavors and fresh ingredients. And that’s why folks in Fairbanks flock for Bistro’s “fresh fare,” including French fries. Their fries are cut fresh, cooked to order, and dusted in bacon salt. Then they’re served with either a buttermilk ranch sauce or a chipotle ketchup. If you need a French fry fix in the Mat-Su Valley, head over to the Last Frontier Brewing Company in Wasilla. Their fries are awesome as-is, but if you really want to be wowed, order the black-n-blue fries. It’s a pile of their delicious fries, seasoned with blackening spices, then slathered in house-made bleu cheese dressing and bleu cheese crumbles. Given the attached vestibule and more than 20 years in the same location, the Burger Bus isn’t going anywhere anytime soon. And for French fry lovers in Kenai, that is very good news. People love the fries—called “delicious” and comparable to those from a beloved burger chain in the Southwestern U.S.—just as much as they love the burgers. Locals in Alaska’s first city love Burger Queen. They love their burgers and milkshakes, but they will fight you for the fries. You can even get Burger Queen’s “most awesome fries” (per an enthusiastic reviewer) next door at the Asylum Bar, where your server will make a burger-and-fries run for you. Now that’s service! Out of the Box started as a popular gluten-free food truck and is now a popular gluten-free, brick-and-mortar establishment that continues to serve some of Anchorage’s favorite French fries. Their fries are fresh-cut, scratch made and absolutely delicious. In Seward, Chattermark serves up all sorts of delicious fare, and so close to prime angling, you know fish and chips is on the menu. You can serve all the fish you want, but without a strong chip game, you’re sunk. Fortunately, Chattermark does not disappoint. They even have sweet potato fries if you want to switch it up a bit. One of the Capitol City’s favorite burger joints is the humble Hot Bite on Auke Bay. For more than three decades, Hot Bite has been slinging burgers, pouring milkshakes, and serving up the fries to eat with and dip in them. You can also get chili fries, if you’re feeling it.